Are you at risk of developing an eye problem? Are you overstraining your eyes? 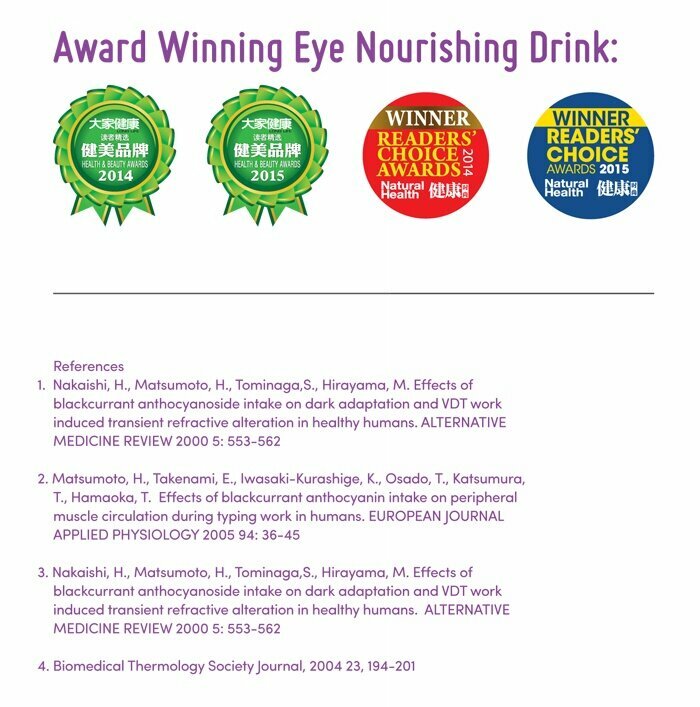 Long term overstraining of your eyes, neglected proper care and poor blood circulations around the eye will lead to the development of dark circles under the eyes, blurred vision, double vision, dry eyes, red eyes, eye irritations, headaches, dizziness, macular degeneration and other eye disorders. Eyesight is said to be the chief of our five senses, as we need healthy eyesight to be able to enjoy the beauties of life. Living in the information age, good eyesight becomes a prerequisite for us to be able to excel with our work and life. 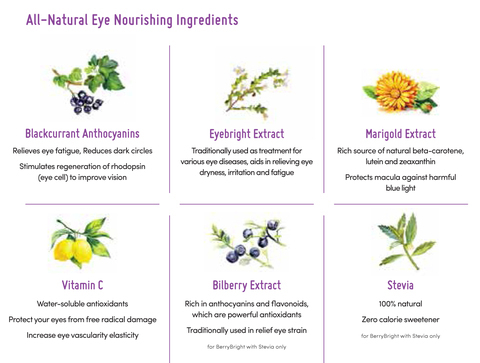 Unfortunately, eye diseases such as glaucoma, dry eyes, age-related macular degeneration, cataract and presbyopia, have become common modern day diseases and are the leading causes of blindness and serious vision loss. Berry Bright is a natural whole food eye supplement that is formulated to help you to easily replenish the vital nutrients that are essential to protect and maintain healthy eyes and vision. Berry Bright contains natural whole food ingredients that are rich in eye nourishing nutrients and beneficial to maintain a healthy vision. 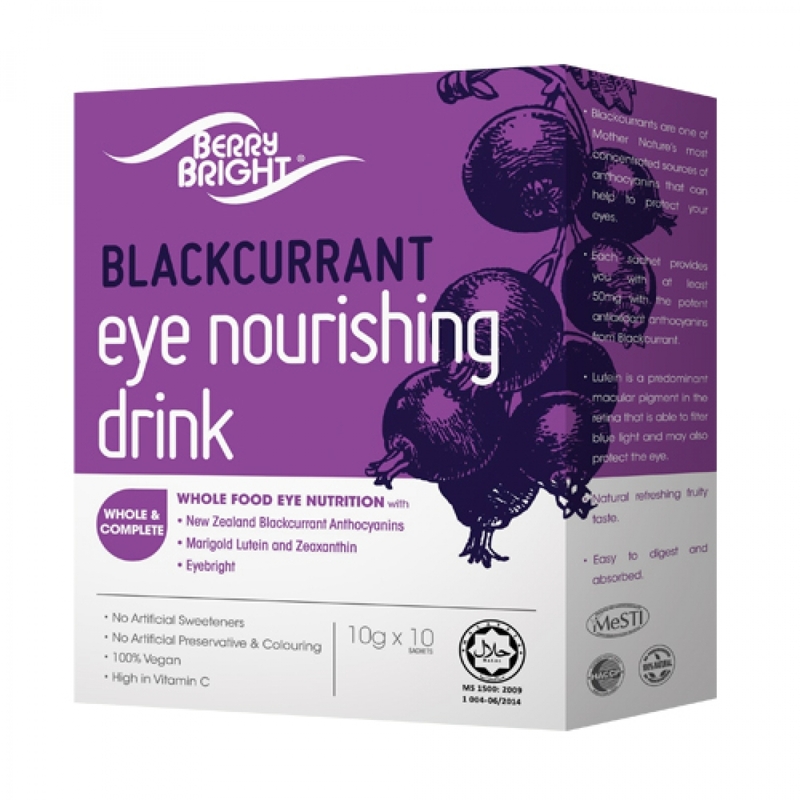 New Zealand Blackcurrant contains 4x more anthocyanins than North American Blueberry, 25x more Vitamin C than European Bilberry, and 2x the antioxidants of North American Blueberry. Berry Bright contains lutein and zeaxanthin, these carotenoids offer blue light filtering and antioxidant to protect the eye. 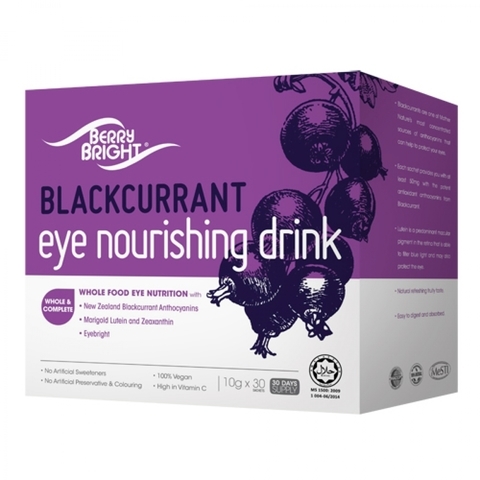 Better blood circulation, helps to eliminate toxins and reduce dark circles formation.